I have had a very busy 2013. I set myself a challenge in 2012 of raising £5,000 for the British Heart Foundation in one year. 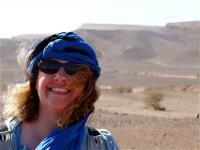 This included completing a sketchbook during a 112k trek in five days in the Sahara Desert in March 2013. I ended up raising £9,840 which enabled me to spread funds across to another charity close to my heart - the Joe Herrington Memorial Fund. With the support of great friends an Auction of Promises and an American Style Tournament helped bring in the donations. The trek itself was a deeply personal experience and my feet have just about recovered. After a two-year break I am exhibiting at the Cambridge Christmas exhibition - one I founded six years ago. Doors will open at 1 pm and close at 8.30 pm. You will find me debuting my collection of boxed cards; jewellery from Bek Genery and Ellie Air; ceramics by Rachel Dormor, Amanda MacPhail and the award-winning Katharina Klug; glass by Molten Wonky and Alison Tait; book sculptures by Justin Rowe; prints, cards and gifts by Alison Huller and Roxana de Rond; handmade books by Edel Hopkin; recylced bags bags and accessories by QHERE; wire sculpture by Rhiannon Thomas; children's books and illustrations by Nicola Killen, and fine art lollipops by Joali. So there is something for everyone! It is only on for one day so don't miss it. One of my favourite organisations to work with are Addenbrooke's Arts. Three large oil on wood landscapes of mine are located permanently in the stairwells of the hospital and you will now find Contemplation Bay, an oil on canvas on level 9. 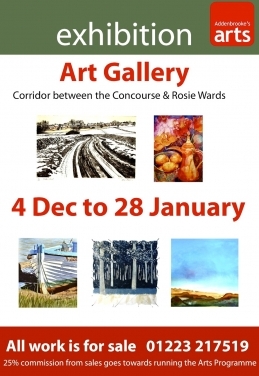 From 4 December until 28 January 2014 I am taking part in a mixed exhibition along the corridor between the Concourse and the Rosie Wards. Fleeting and Out To Calmer Waters are large oils on canvas, Inevitability and The Golden Pathway are framed oils on wood panels. All works are for sale and 25% commission goes towards funding the Addenbrooke's Arts programme. I am known best for my large oil landscapes, full of colour and skies. However 2013 has seen me launch a totally different side to my work - solar plate printing. The start of my collection was the launch in the summer with a 'A Tale Of Two Cities' - a body of work focused on the cities of Cambridge and Oxford. I am also working on a range entitled 'Friendship Cups' based on my love of taking a coffee or tea break with friends. As a result of the new collection of solar plate prints I have produced a range of boxed sets of 8 greeting cards. 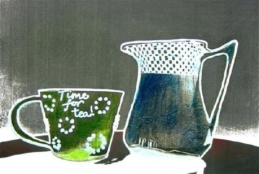 The first to be launched is called Cambridge Walkabout and the other 'Time For Tea!' The Cambridge Christmas show on 25 November will see the very first boxes go on sale. There are also two other collections - one of my landscape paintings and a boxed set of postcards. I will also have some of my prints that can be purchased and gift wrapped at the show too. 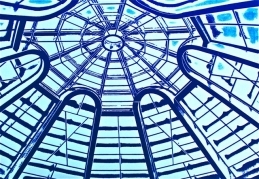 2014 will see the launch of a collection of larger solar plate prints at Bishops Stortford College with The Purple Printmakers with special guest Susan Jones. More information about the exhibition will follow in the next few weeks. After that I will be hibernating in the studio working on an exciting new printmaking exhibition based in central Cambridge that I am co-founder of and also a solo show at Over Gallery in October with a new range of oil paintings. 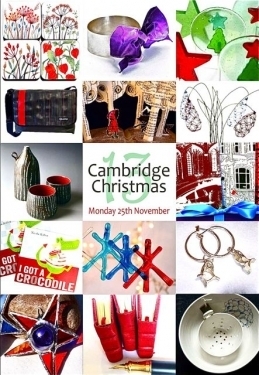 Thank you for all your support during 2013 and I hope to see you at the Cambridge Christmas show on 25 November.